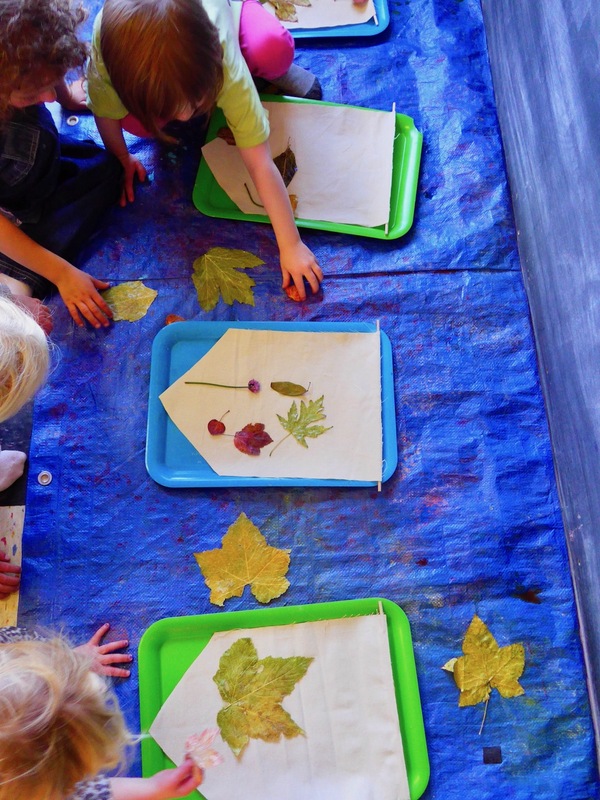 After observing and talking about the changes outside in nature and reading various books about autumn, the children started to notice how many different leaves there are and wondered more about leaf veins and why leaves fall off the trees. 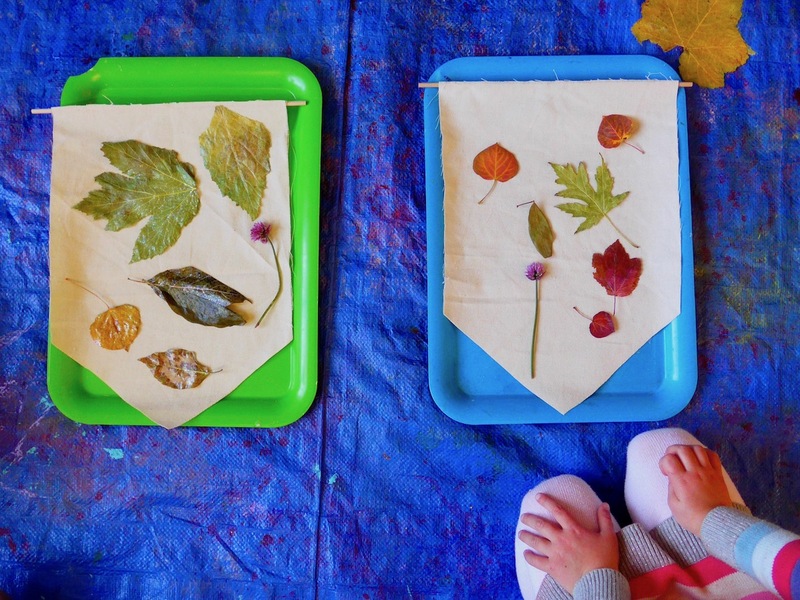 Their thoughts and questions about autumn are constantly present while playing and creating. 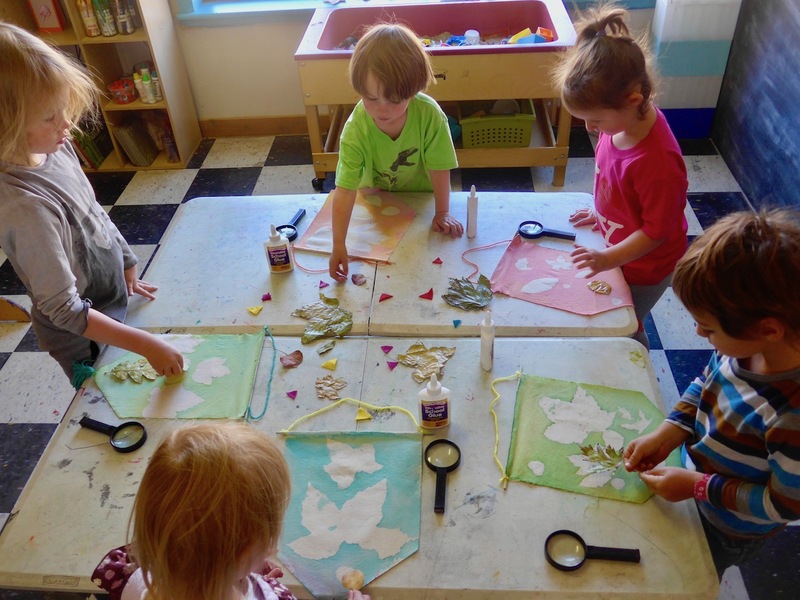 Through art projects that are based on children’s interests and accommodate their inquiries, thoughts and ideas, we can really open up endless possibilities for learning! 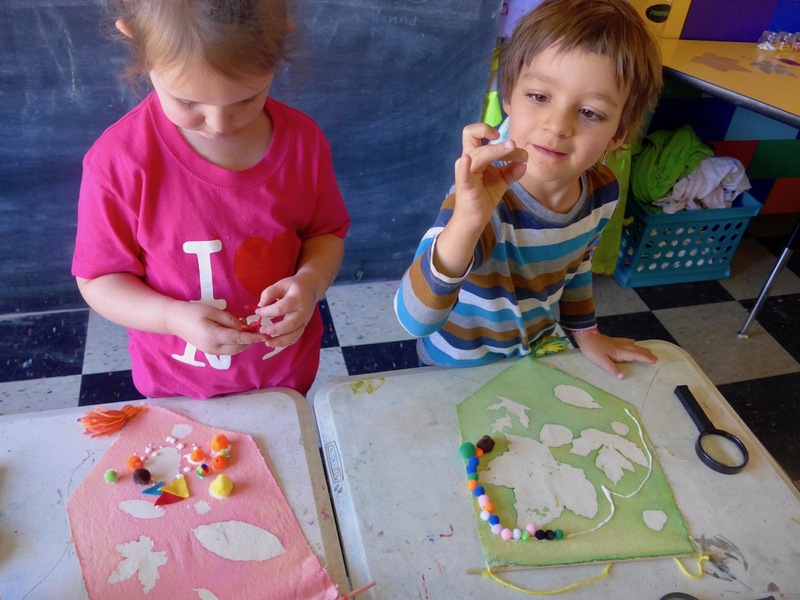 For younger children, creating art is mainly a sensory exploration activity. 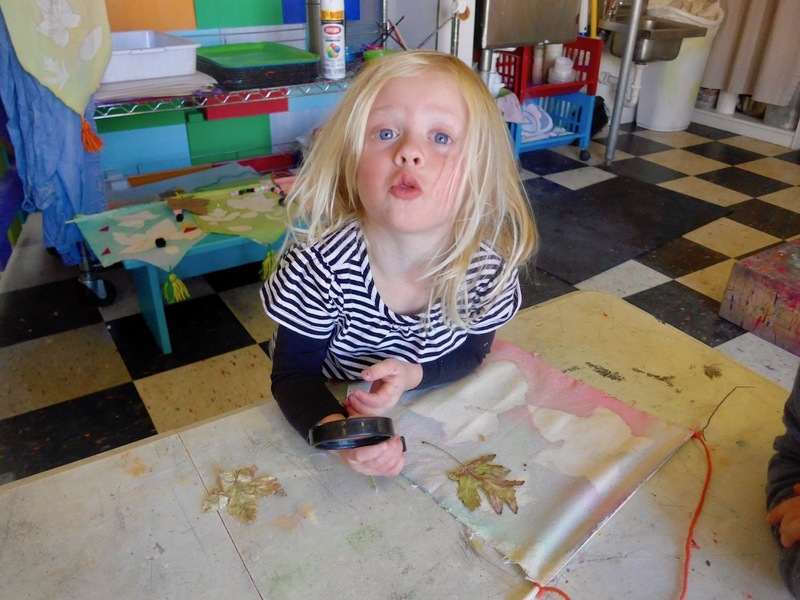 As children grow older and get more familiar with different art media, creating art moves beyond sensory exploration. 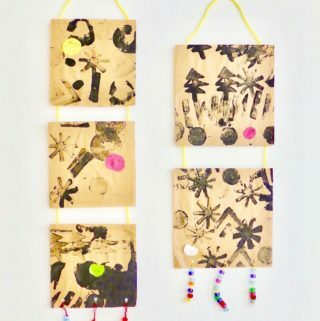 Artwork becomes more and more centered around what children know and feel as they are trying to make sense of their world, and increasingly use symbols to express and represent their understandings of important life events, thoughts and emotions. 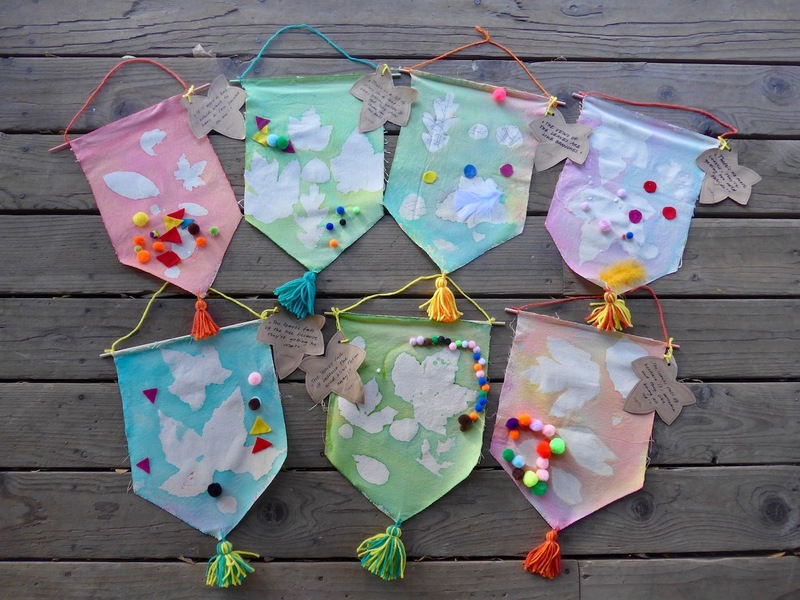 Cut the canvas banners to your desired size ahead of time. Hot glue the wooden dowels to the banners and set them onto trays on the floor. To protect your floors, put a tarp underneath. 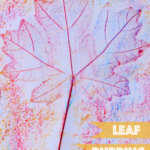 Collect leaves with the children (head over here if you need a good book and introduction to autumn leave projects). 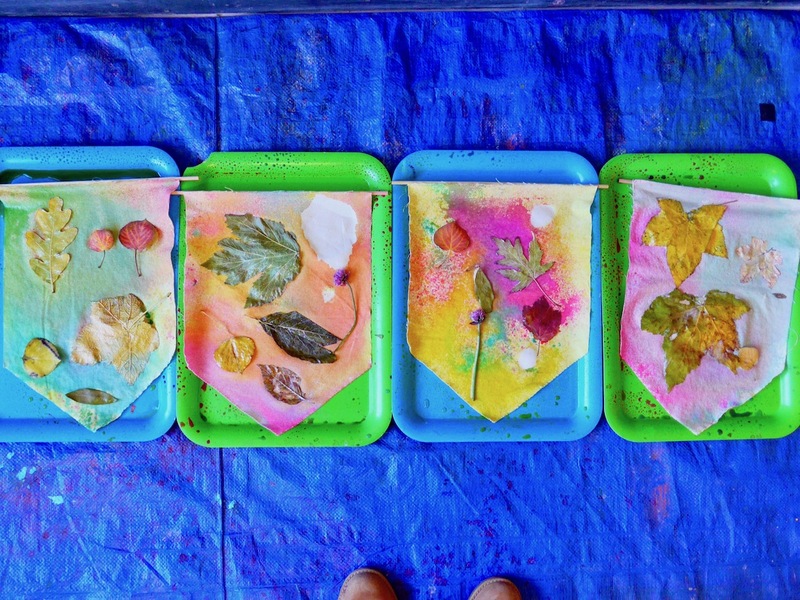 Invite the children to join you on the floor in front of a tray where they can pick and lay down the leaves on their banner, in any design they like. 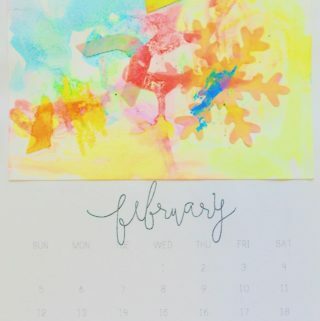 Fill spray bottles (one for each child) with water and a few drops of different colored liquid watercolors until you like the hue and intensity of the color. 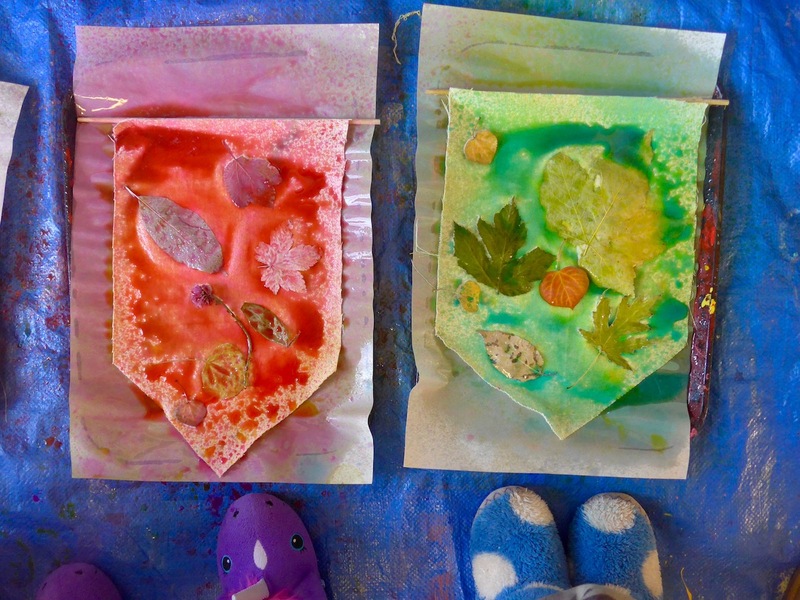 Stronger colors work better since the watercolors will seep into the fabric and look a little less vibrant when dry. 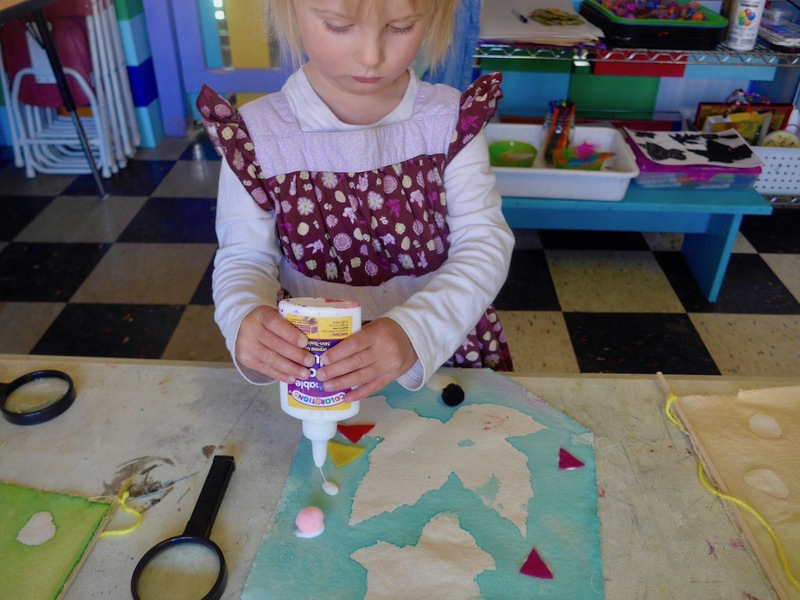 Show the children how to use the spray bottles: Spray from the top, not from the side. Do only a few spritzes at a time. 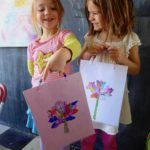 Ask a friend to trade colors with you. Pay attention not to spray in the same area over and over (puddles!) 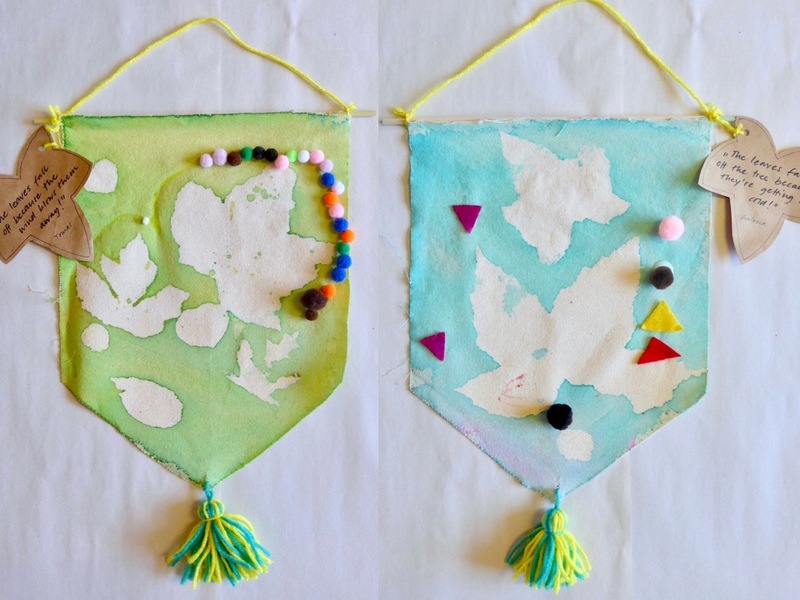 but all over your banner until there is no white left. 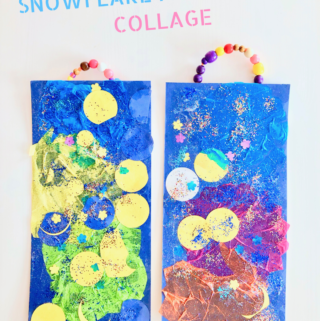 Encourage color mixing and discuss how we can ask each other kindly for turns with the colors, set a timer to share, work out a trade or establish that it’s ok to say “I’m using this color right now, you can have it when I’m done!”. 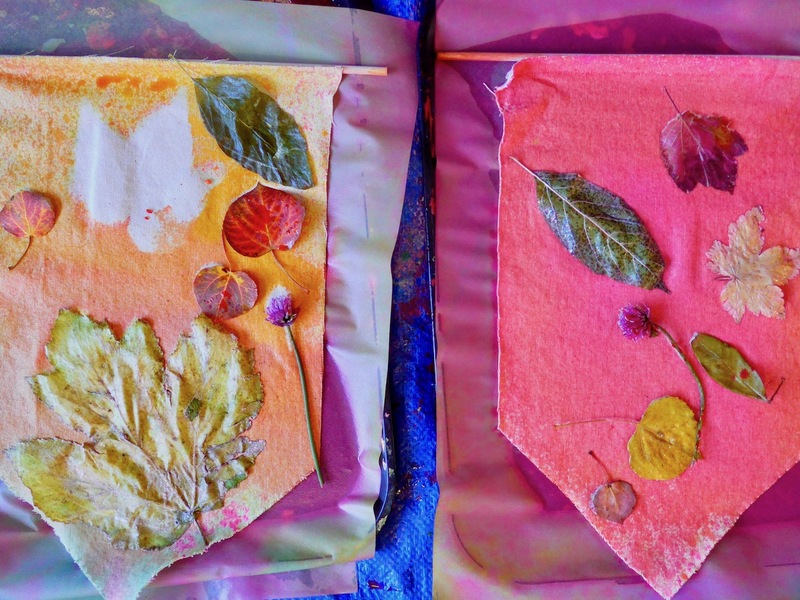 We carefully removed our leaves while the canvas fabric was still soaking wet which turned out fine. 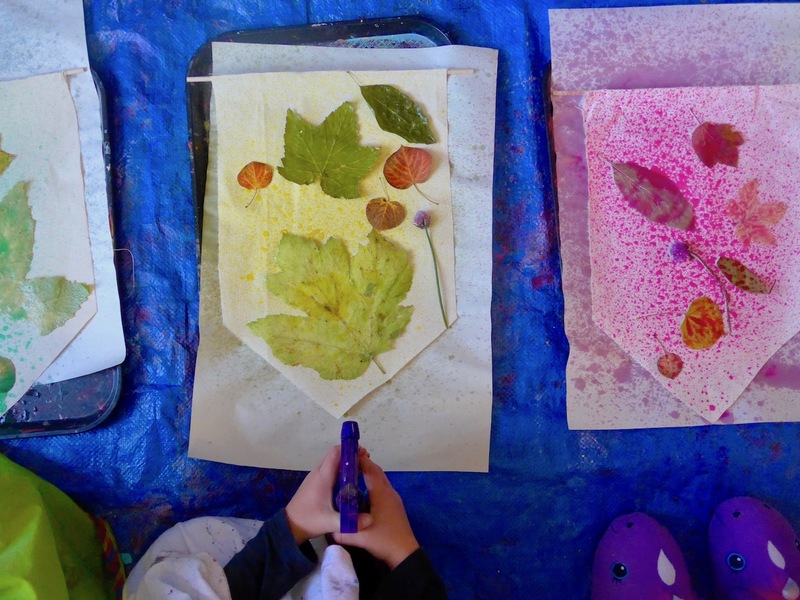 Once our banners dried, we tried to match the different leaves to their prints and talked about the shape, the textures and the features of each leaf. 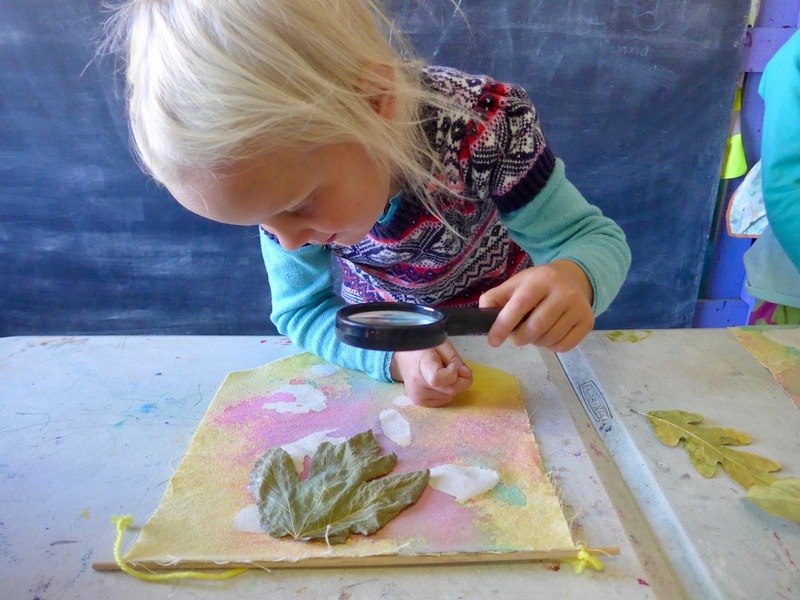 We looked closely with magnifying glasses and wondered more about why the leaves have veins and fall off the trees (read more here). 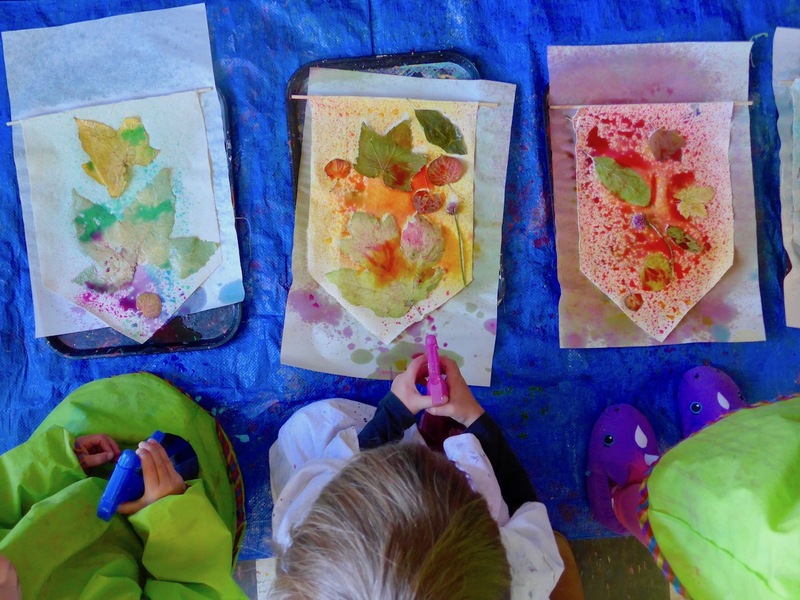 Our thoughts were present as we decorated our leaves. 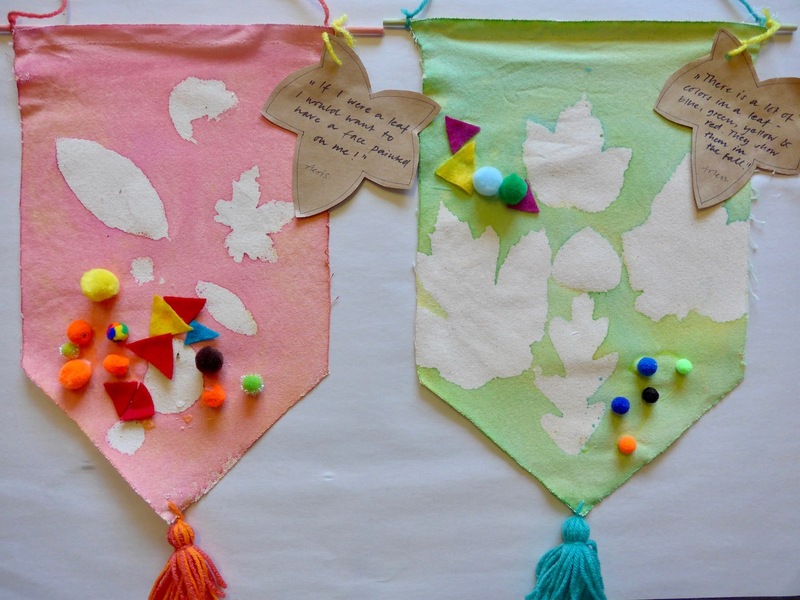 Invite the children to further decorate their leaf banners with felt shapes and pompoms. 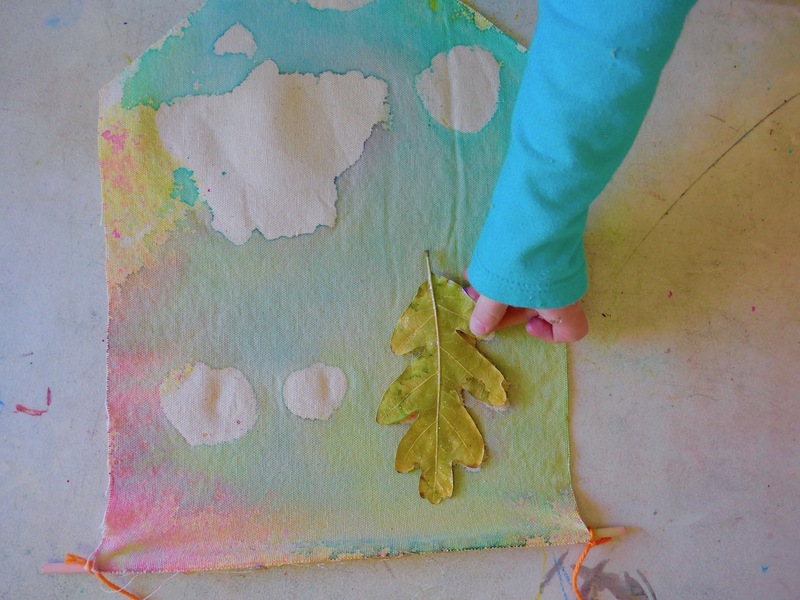 Show how to squeeze a small amount of glue onto the fabric and press a shape onto it. 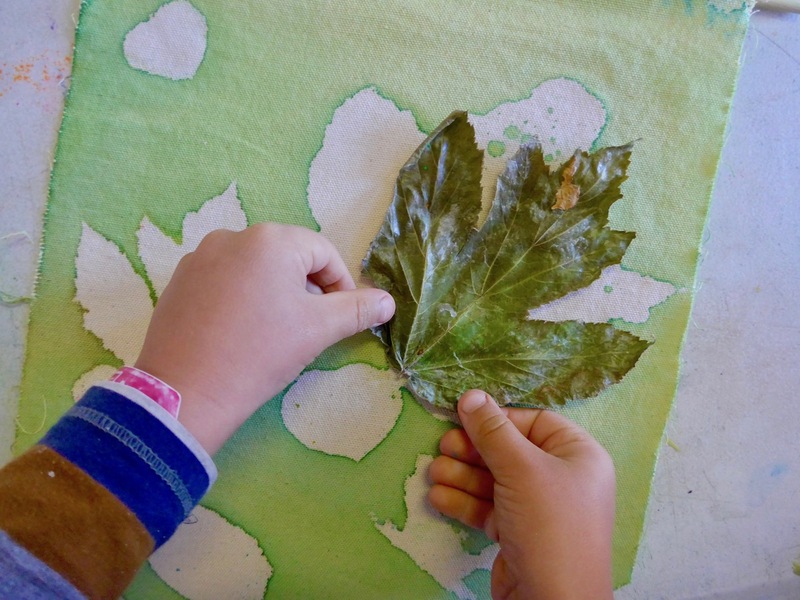 Some of the children used a black Sharpie to draw leaf veins into their leaves. 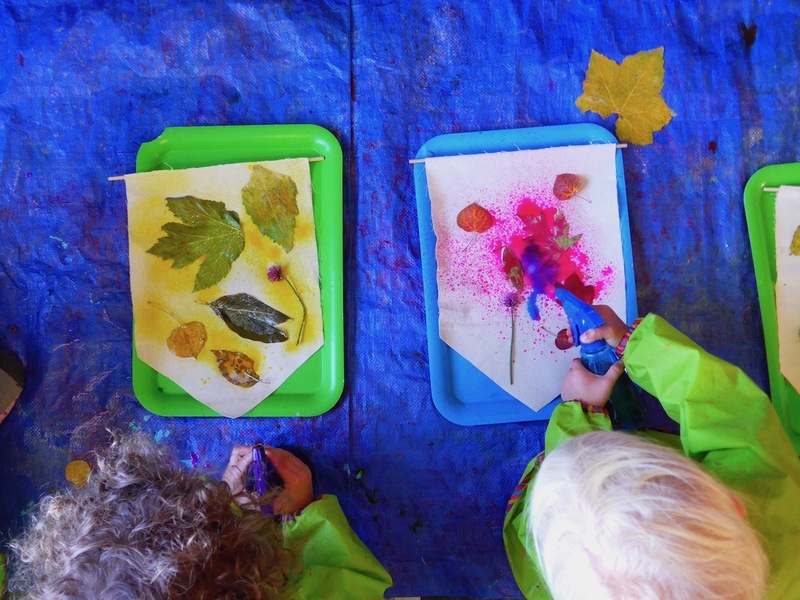 As the children are working on decorating their leaves they express their thoughts and further build their understandings about leaves. 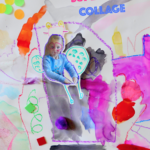 I try to encourage and let children explore and create their own theories as their brains are still growing – developing logic, gathering, connecting and making sense of information as well as working their ‘thinking muscles’. 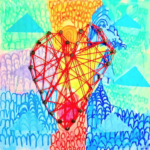 Here’s some of the conversations and thoughts I’ve overheard and always try to write down to share with the parents while the children are creating, processing information and forming their ideas. 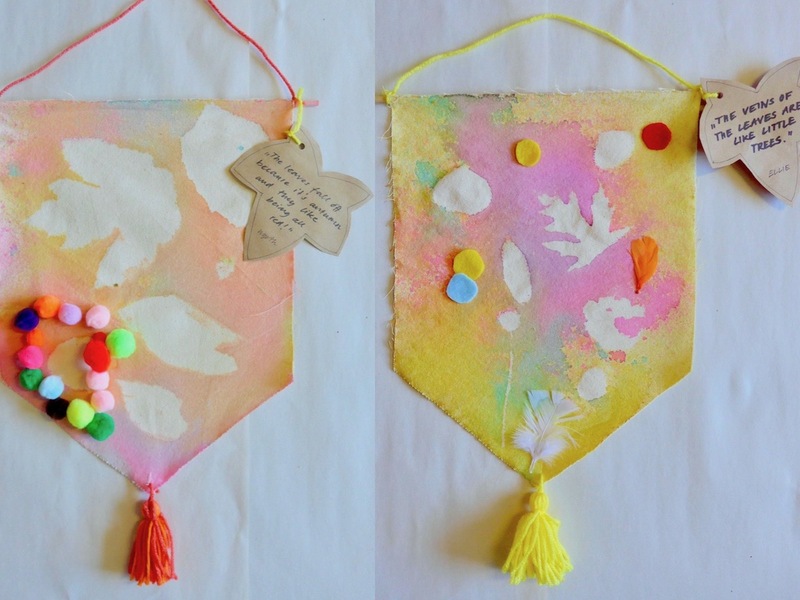 I also knotted a strings to the dowels to create hangers and attached yarn pompoms that we’ve made on a different day at the bottom of each leaf banners (simply cut a hole and string the pompom through). The leaves get blown off by the wind! 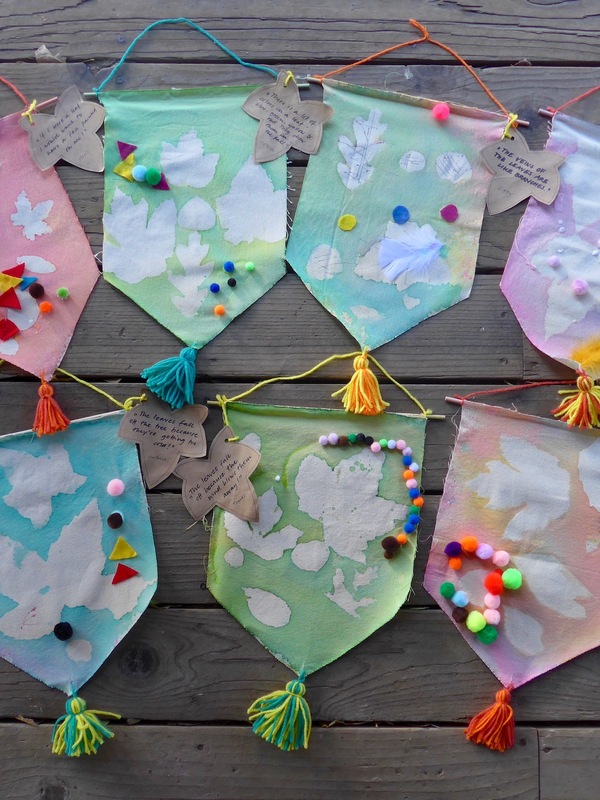 I need lots of pompoms, they’re making wind! 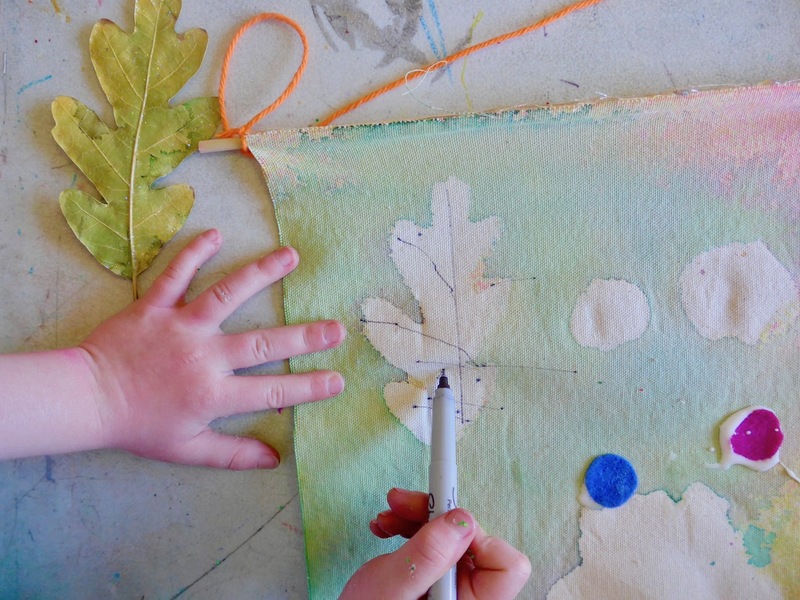 (T., drawing around the leaves with glue and pompoms). The leaves have veins, they’re like branches. The lines are holding it together. 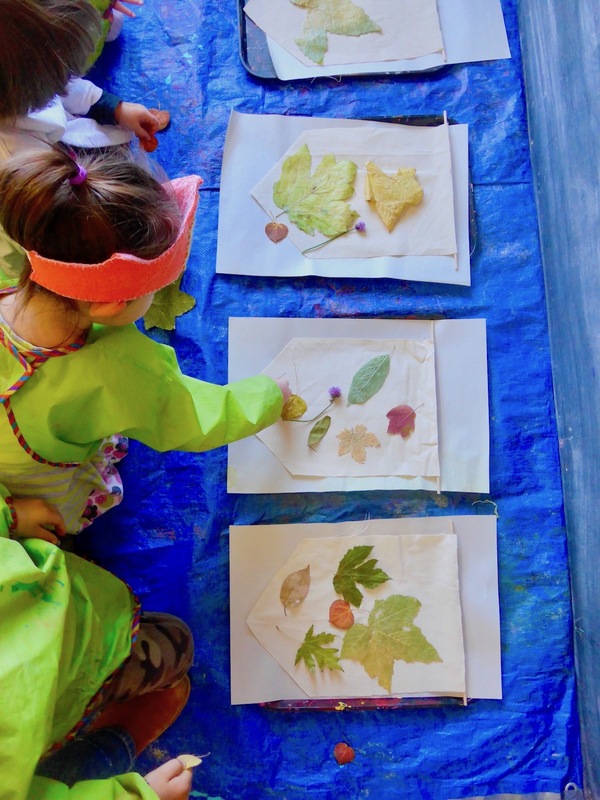 (C., observing different leaf veins, then drawing lines into her leaves). The veins in the leaves are like little trees! 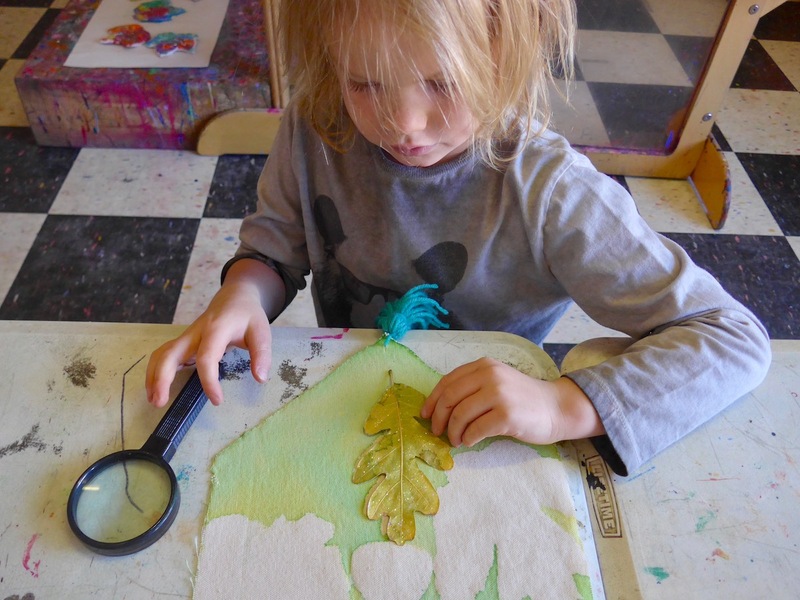 (E., observing and responding to C. who is looking closely at her leaves).